It doesn't get much more meta than this. 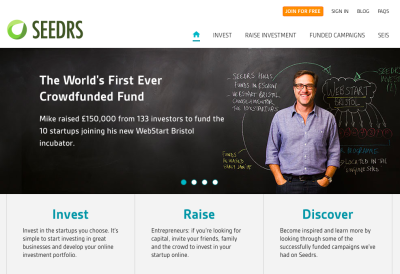 Seedrs, the UK equity-based crowdfunding platform, is listing itself on its site in a bid to crowd-raise £500,000 for international expansion. Armchair investors who put in for aslice of the action will in total get a 8.81 percent stake. This gives the 2009-founded company a pre-money valuation of £5.175 million. “Our goal is to open startup investing as widely as we can, and a key part of that is about exposing investors to dealflow wherever it's located, and giving startups access to capital wherever it's located”. However, Lynn concedes that equity-based crowdfunding platforms like Seedrs rely heavily on ‘network effects'. The deeper the pool of investors attracted to the platform, the more value that is created for entrepreneurs. Conversely, the more dealflow provided by Seedrs, the more value it creates for investors. “We're very much a network effects-driven business, and while the costs of expanding to some regions might outweigh the benefits of the expanded network, our starting position is to say that we want to be open to as many people as possible. Since launching in July 2012, Seedrs has seen 49 deals struck, totalling £2.5 million in funding. From there, it's not hard to gauge the company's own revenues. It charges 7.5% in fees for each successful raise on its platform, as well as the same again on any (future) profits made by investors, such as via an exit or dividends. I'm also told this amounts to 80% quarter-on-quarter revenue growth against 6% quarter-on-quarter cost growth, though without breaking out the raw numbers in terms of burn-rate, that's fairly opaque. “We're raising on our own platform because we think it's a good commercial and marketing decision,” says Lynn, adding that it would look “strange” for Seedrs to promote democratised investing but then “run off, raise our money from institutions and cut out our customers”. In addition, just like any crowdfunding campaign, Lynn hopes it will create a large base of “mavens” and supporters. “We'd love to see 500 people – or even 1,000 – invest in us, because that would be a massive base of people who would use us, get their friends to use us and bore everyone they talk to about how great we are”. That's not say that Seedrs won't look to another VC funding round in the future, but it would have been especially complicated to combine VC funding with crowd funding, says Lynn.